What marks the end of summer in your mind? The day after Labor Day? The first day of school? The moment the leaves start to change? This year, the first day of autumn officially fell on September 23, but I've come to expect Indian summers in San Francisco, with glorious summer sunshine lasting well into October. Here at Carrie Cakeaway, what signals the change in seasons isn't weather, but produce. Every summer, we look forward to bright, juicy berries, ripe peaches and plums just bursting with fragrance and flavor, and plump, jammy figs. When these start disappearing from the marketplace, our hearts sink just a little bit -- apples, even in all of their beautiful varieties, just aren't the same. 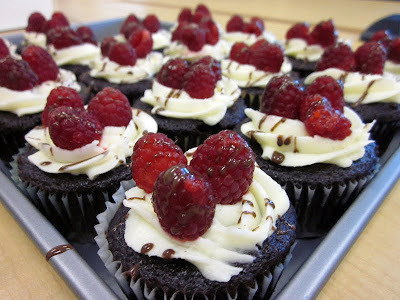 So this post is dedicated to the last of the berries, stone fruits, and other sweet summer fruits, and one of our favorite summer creations this year -- our chocolate-dipped raspberry cupcake. 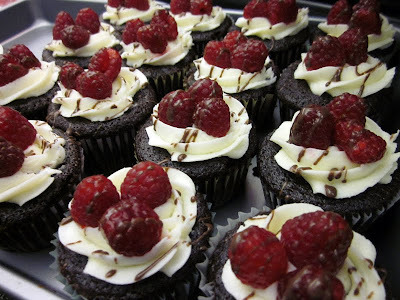 Inspired by Monica, who first requested these for a bridal shower in July, we couldn't get enough of these rich chocolate cupcakes topped with tangy cream cheese frosting, a trio of fresh raspberries, and a drizzle of dark chocolate fudge. Now that we've gotten that out of our system, we'll quietly tuck our sundresses away and try to stop with the pouting. After all, we're well into pumpkin season and Halloween is right around the corner! What are you going to be this year?